More than half a million people have applied for the paid military exemption introduced for a temporary period in Turkey so far, according to Saturday's statement by the Turkish General Staff. The statement said that more than 515,000 citizens have applied to complete their military service in 21 days instead of five months and 14 days for university graduates or 12 months for non-graduates. 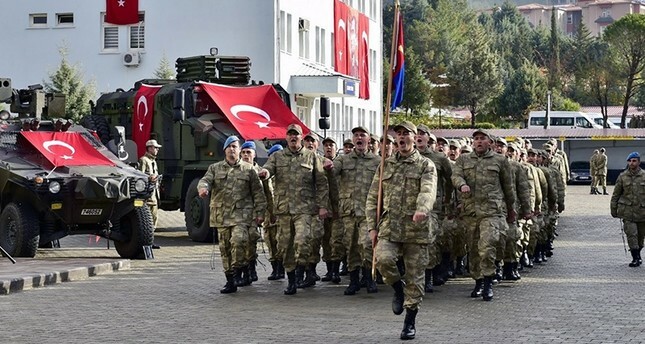 Turkey's parliament on July 26 ratified a temporary law that enables Turkish citizens born on or before Jan. 1, 1994 to reduce the term of their military service by paying 15,000 Turkish liras ($2,430). Turks who reside in other countries must pay 2,000 euros. The application submissions started on Aug. 3 and will end on Nov. 3. The number of applicants who completed their applications and paid their exemption fees has reached 170,000. Meanwhile, the Ministry of Education announced Friday that teachers who wish to apply for paid military exemption will be allowed to carry out their 21-day service during the semester break or summer vacation. Proponents of paid military service claim conscription derails budding careers. Many who campaign on social media are university graduates and complain that serving a shorter conscription period should be replaced with an exemption to boost the economy. Ankara sees the military exemption as a step towards a professional army. Currently, the army consists largely of conscripts that Turkey only recently stopped deploying for counterterrorism and other risky operations. Previously, soldiers were forced to serve in dangerous areas with little training in their short tenure in the military, often ending up killed in counterterrorism operations.